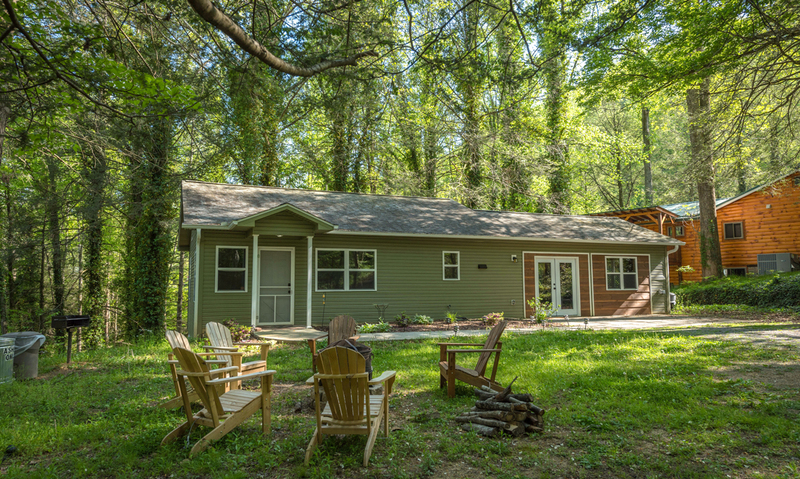 Budding with wooded views and cabin charm, Red Bud Cottage is a single-floor home in the Great Smoky Mountains - just 1 minute from downtown Gatlinburg! 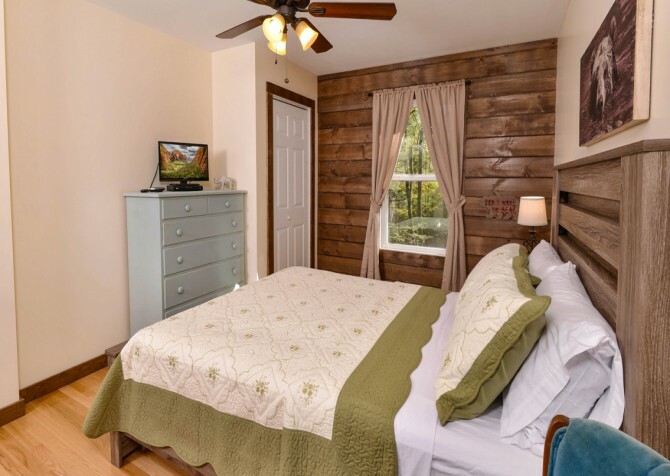 With room for 6, this Gatlinburg cabin — boasting 2 bedrooms, a fully equipped kitchen, and an entertaining space in the living room — is a great choice for a couples’ retreat or getaway with friends. 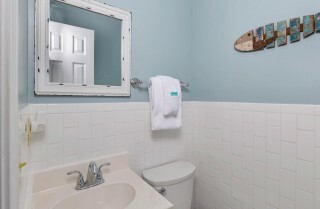 As a bonus, this abode lies in the heart of Gatlinburg, keeping all the fun-filled attractions, Southern-style restaurants, exciting seasonal events, and intriguingly unique museums close by for your convenience. 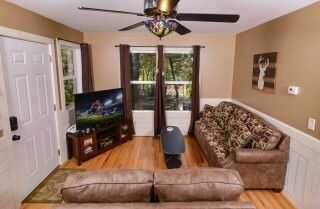 Leave your bags in the car and step right into the living room just off the entryway. Hop on the couch and flip on the big screen TV or just take a load off on the love seat — you deserve a relaxing break after your travels. Pop a movie (bring your own or choose one from the provided collection) in the DVD player for a movie night in with your buds or bust out the Family 10 Game Set from the TV stand to duke it out with the kids. 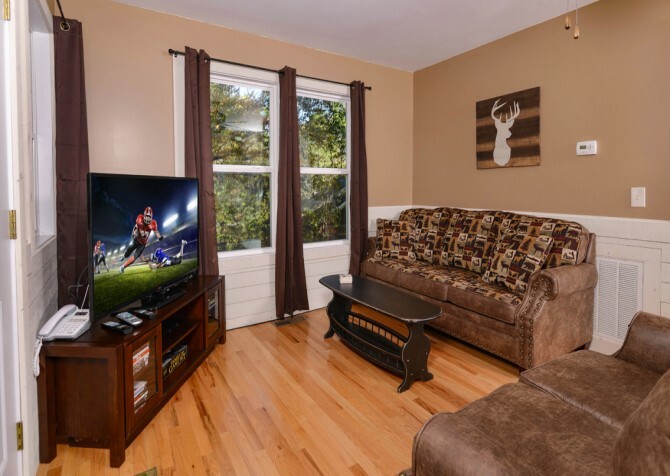 When you’re tuckered out from your Gatlinburg adventures, pull out the queen sleeper sofa and let your favorite TV show lull you to sleep. 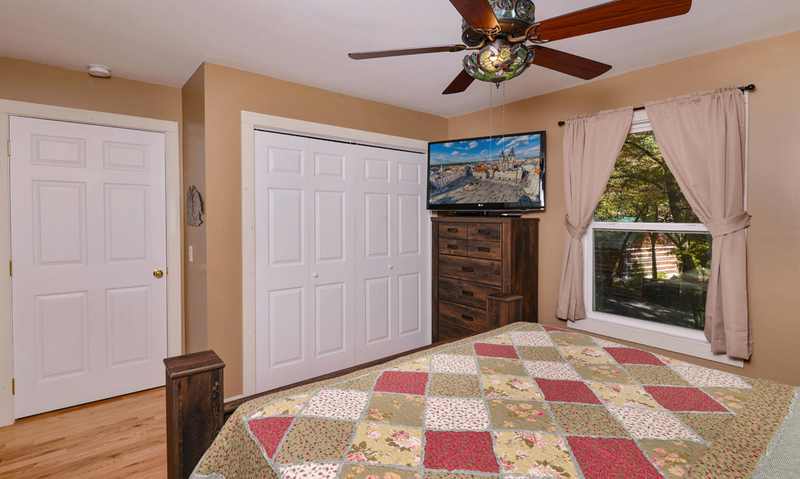 Wake up to charming wooded views or keep the curtains closed to sleep in until noon. 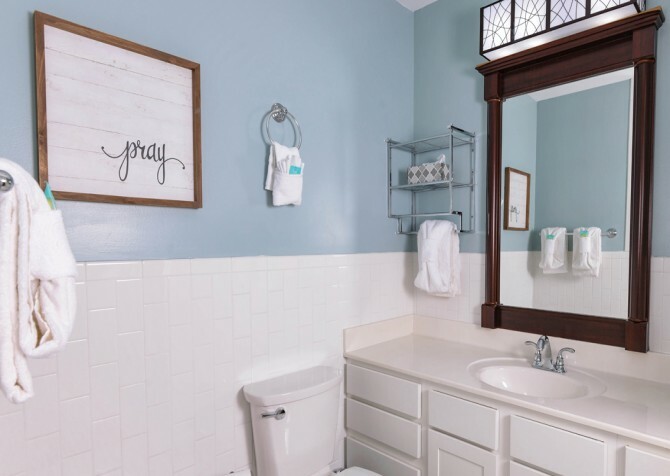 With close proximity to the kitchen and a coffee table nearby, not only are midnight snacks an option, but you’ll also be able to grab the first morning cup of joe! For tasty meals, decadent snacks, and tempting treats, head to the fully equipped galley kitchen. Save a little spending money by utilizing the stove for dinner, the microwave for leftovers, the refrigerator for drinks, the blender for smoothies, the toaster oven for breakfast bagels, and the coffeemaker for your morning jolt. With pots and pans at the ready, you’ll be cooking up a storm in no time! 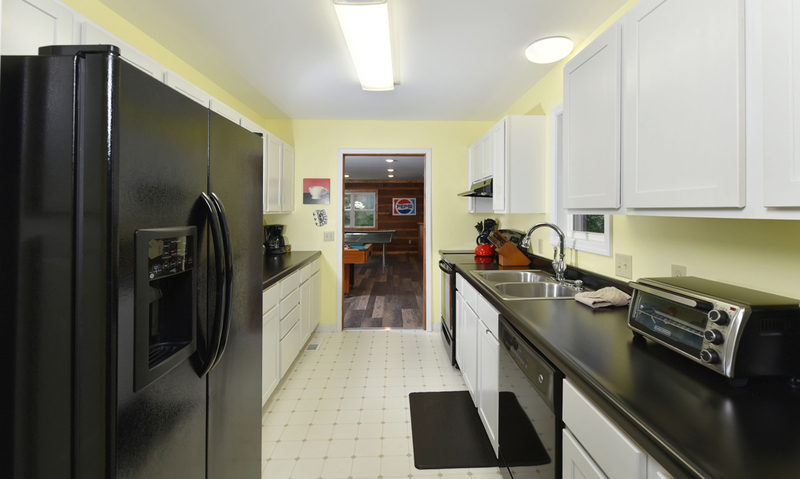 Plus, there’s an electric can opener for soup, a bottle opener for beer, a tea kettle for your special herbal blend, a stainless-steel double sink for washing veggies, and a dishwasher to take care of the mess. 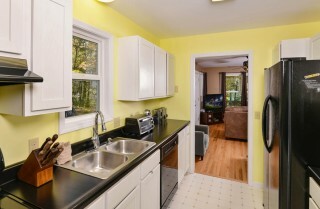 Serve up your homecooked meals in the dining area — conveniently located between the kitchen and the living room. 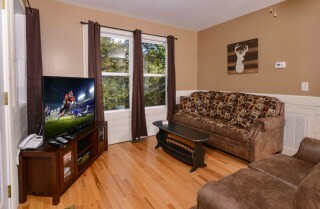 Check out the wooded views from the large window or watch TV while you dine. Better yet, go around the table and have everyone share their favorite part of the day in town. Accompanied by 4 matching stools, the wood-top dining table is not only useful for mealtimes but also handy for game night. 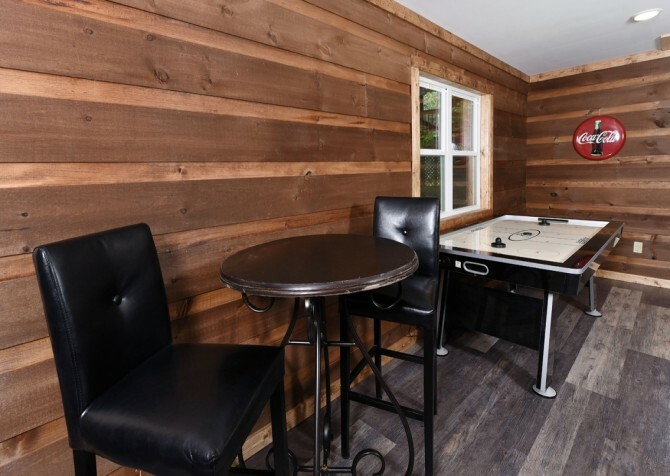 A reading nook can be found nearby, so if you’re a light sleeper or simply want alone time, grab the latest romance novel and curl up in the arm chair for an evening lost in the pages. There’s even an end table with coasters — ready to keep your cocoa company! Make your way to the master suite for a midday cat nap or a comfortable night’s sleep on the king-size bed. 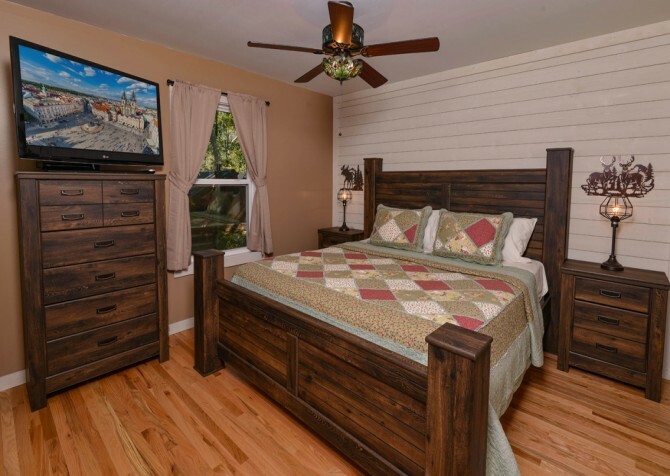 If your dream vacation has you too excited to shut your eyes, the flatscreen TV on the dresser is a good option to keep your mind occupied. Who knows? You might even see an ad for a new Gatlinburg attraction to check out! 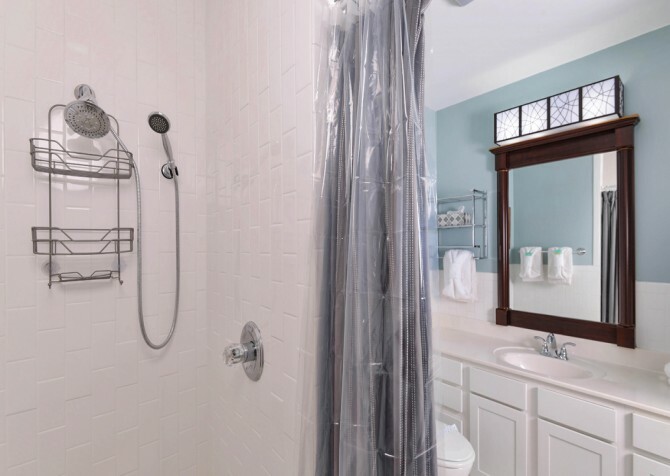 Before you head into the city, enjoy a nice, hot shower in your en-suite bathroom, which sports a large vanity and even a posh bidet. A queen-size bed awaits in the second bedroom — along with a flatscreen TV, a large wingback chair, and wooded views. Recharge with a rest on the bed while your phone does the same on the nightstand or chuckle to a comedy classic while relaxing in the spacious chair. With a half bath just outside the bedroom door, practicality is certainly present at this cabin. 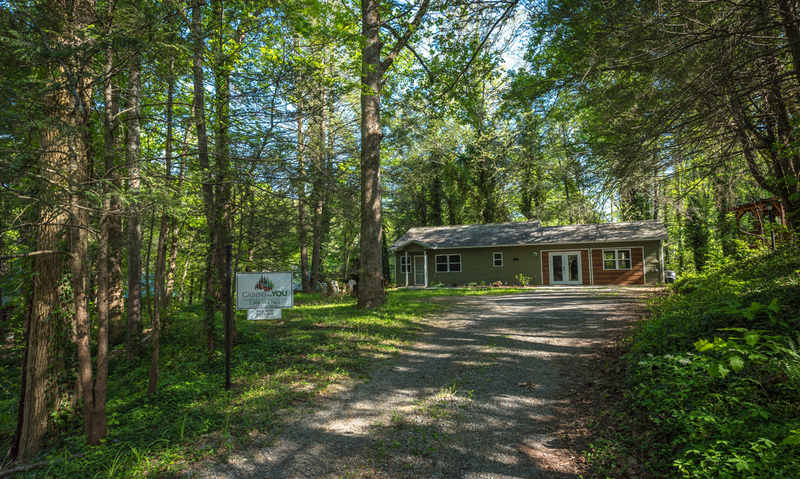 Upon your arrival, you’ll notice a large front yard and flat, gravel parking for 4-5 vehicles (with room for a trailer). Leading up to the front door is a paved walkway bordered by solar lights to show you the way after a night on the town. Beckoning for a mountain-style barbecue party, a picnic-style, charcoal grill and 6 wooden patio chairs surrounding a covered metal fire pit await in the sizeable yard. Leave the front door open and the screen door shut to let fresh woodland air into the home, and when dinner is done, gently ring the hanging bells by the front door to signal the feast! 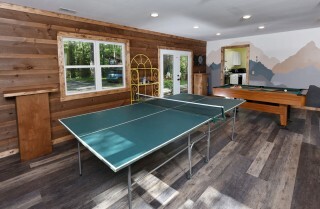 The exciting new rec room at Red Bud Cottage is fun, cool, and full of mountain charm! 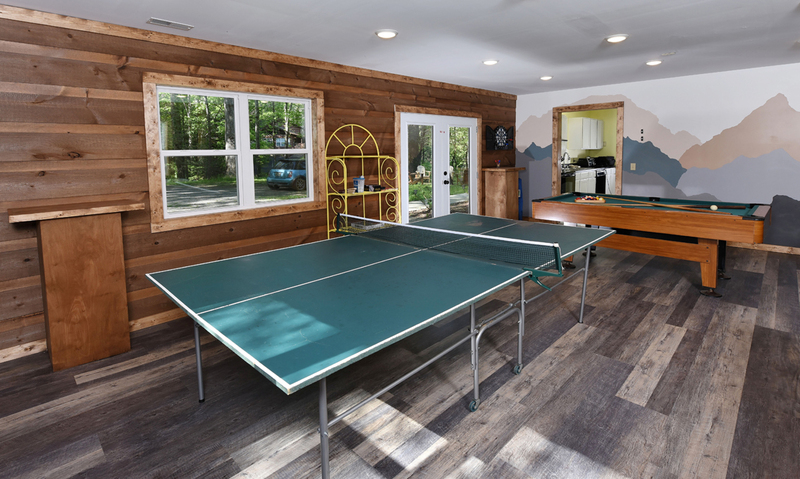 Wood walls and floors pair perfectly with the painted mountain mural, and you can spend hours shooting pool or playing air hockey with kids and adults here! 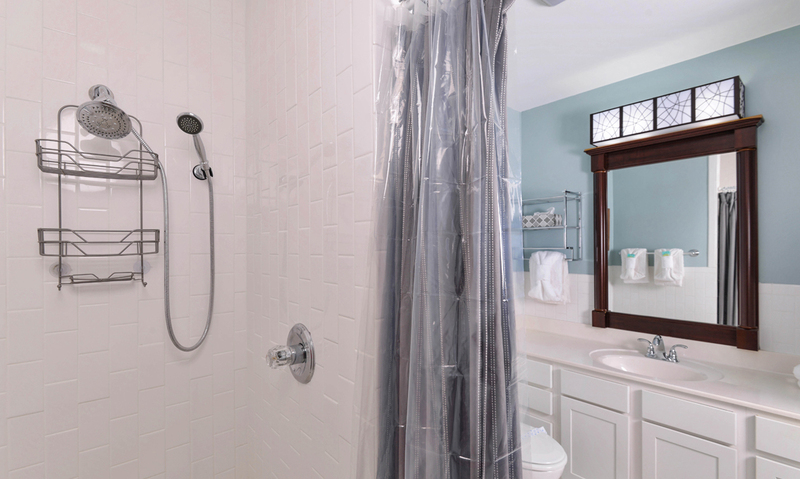 Leave your heavy suitcases at home, because this cabin comes with a washer and dryer, so you can wash clothes and towels as needed instead of overloading the car. Google the best barbecue side dishes or just browse social media like normal with the complimentary high-speed internet. 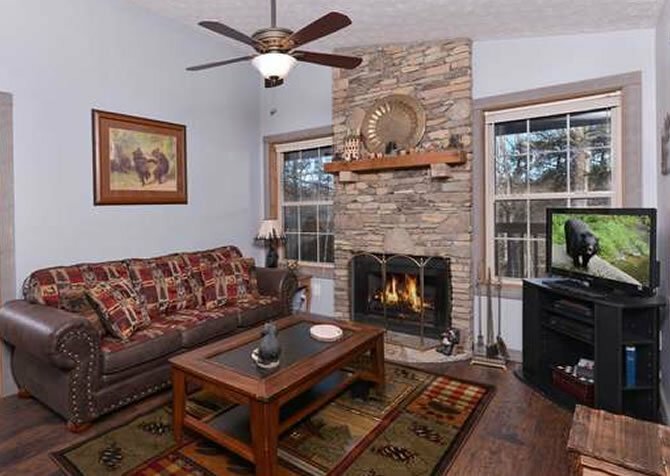 Most noteworthy of all, this vacation rental is pet-friendly, so bring your fur baby along for your Smoky Mountain trip! Play catch in the front yard, go for a hike together on a local trail, and bring back new treats for your pup to try from town. Nestled in the heart of Gatlinburg, Red Bud Cottage is close to many top-notch local attractions, impressive restaurants, and nature activities. 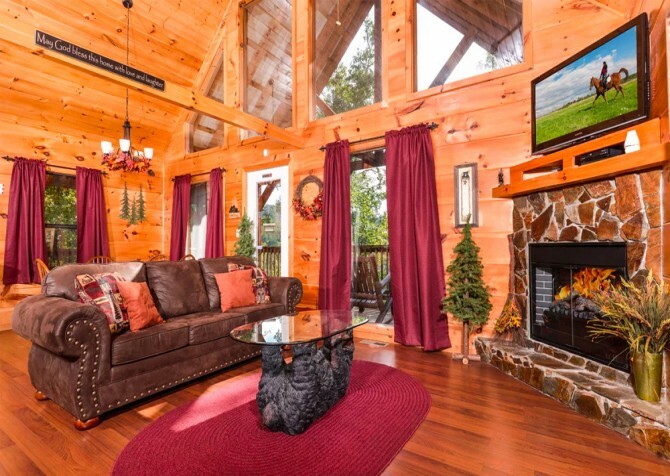 It may be hard to leave your cozy Gatlinburg cabin, but for the full Smoky Mountain vacation experience, it will be worth it! Enjoy a day filled with smiles at Ober Gatlinburg with a wildlife encounter, snow tubing, delightful shops, and delectable eateries! Sea life in the middle of the mountains? Yep, check out Ripley’s Aquarium of the Smokies for sharks, rays, clownfish, penguins, and more! Ride through the forest on the Gatlinburg Mountain Coaster. With the speed at your control, go for a calm or daring experience — it’s up to you! 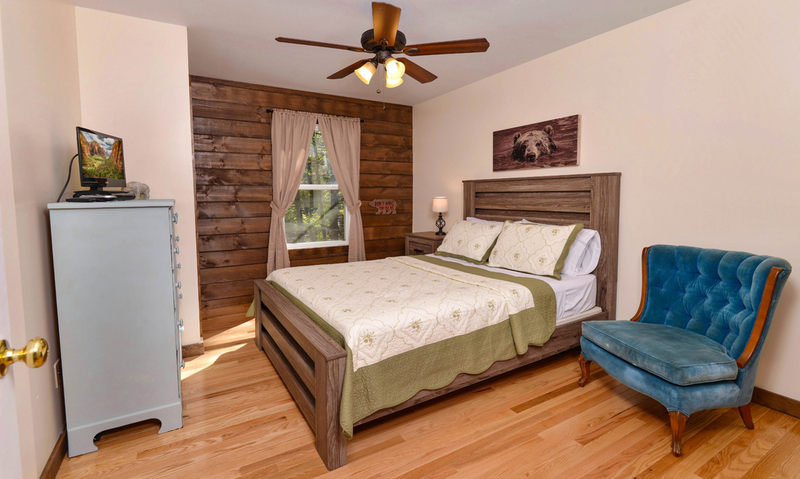 "This was our first stay with Cabins For You and it was phenomenal! We stayed in the Red Bud Cottage and it was perfect for our Christmas get away as a family of 5. The cottage was beautiful! 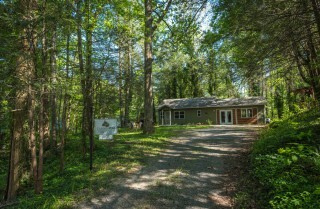 The location was about 1 mile from…"
"Loved this cabin!! 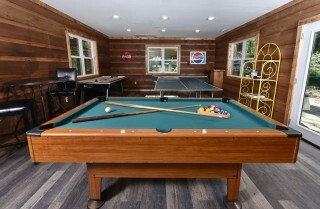 It was very clean and we loved the game room! Cabin was super close to downtown and easy to find. 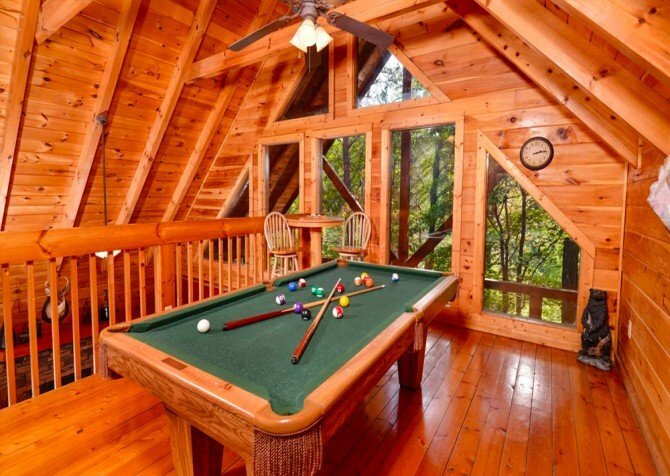 Definitely would recommend this cabin to others!" Thank you so much for he great review! 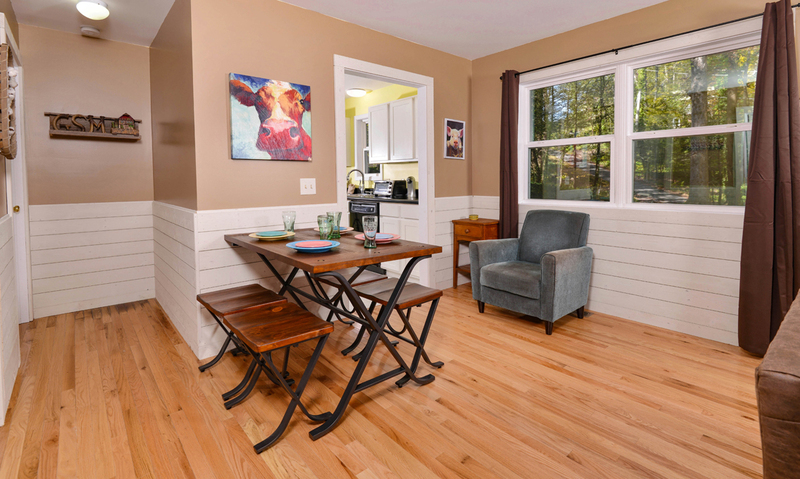 We are so happy to hear you loved the cabin and that it was easy to find! We are looking forward to having you stay with us again in the future! "This was our first stay with Cabins For You and it was phenomenal! We stayed in the Red Bud Cottage and it was perfect for our Christmas get away as a family of 5. The cottage was beautiful! The location was about 1 mile from downtown Gatlinburg which as perfect. 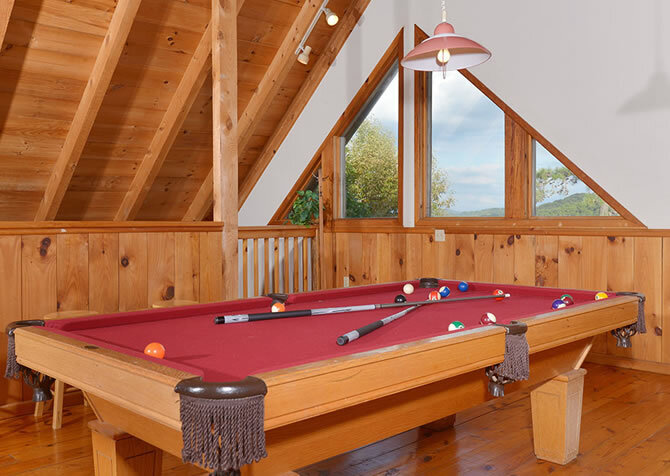 My teenagers loved the game room and we all played many games of pool, air hockey and ping pong. We were very pleased with Cabins For You and with our stay. There are absolutely no complaints from us at all! We will definitely be using Cabins For You again!!!!" Yay! We can't stop smiling! We couldn't be happier to hear how much you and your family enjoyed your cabin stay at Red Bud Cottage, playing games and making memories. We can't wait to serve YOU in the near future! Come back soon! "We stayed at Red Bud Cottage, very pleased. It was decorated for Christmas. Beautiful. 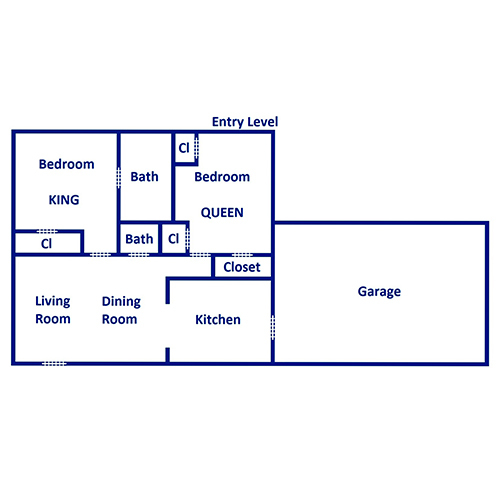 Full kitchen, game room, comfortable mattresses. Our 1st cabin in the mountains, so pleased we chose this one!" 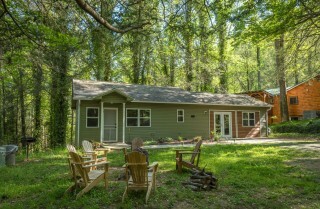 "We spent Christmas week in the Red Bud Cottage located in Gatlinburg, Tn. 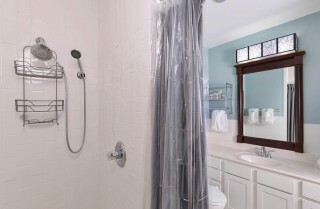 It was perfect for our family, plenty of space, clean, beautifully decorated, a perfect location and pet friendly. This was one of the best stays we have had in a long time, certainly the best Christmas. We will definitely use Cabins For You again. "